Cliff Goldsmith was a key backroom operator in the West Coast soul/blues scene of the 60s – writing, arranging and producing some very fine music. 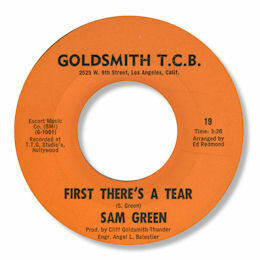 He only briefly owned his own label but this 45 from Sam Green was undoubtedly the pick of the releases. The downtempo First There’s A Tear has the wonderful combination of gospel and blues influences that so characterised the best black music coming out of Los Angeles. The church tinged piano/organ playing is superb and the blue chord changes are right in the pocket. You can hear that Sam had spent a lot of time listening- and maybe singing – sanctified material too. You’ve got to love the way he’s all over the melody. I could listen to this sort of stuff all day. 1. There is an alternative issue of this 45 with the uptempo “It’s time to move” retitled as “Oh girls”. It is the same song. 2. I’m almost certain that the Sam Green who recorded for WE and D & G in the 80s and 90s is a different artist. Special thanks to David Cole for help and info.